The Battery is a landmark defensive seawall and promenade in Charleston, South Carolina, famous for its stately antebellum homes. It stretches along the lower shores of the Charleston peninsula, bordered by the Ashley and Cooper Rivers, which meet here to form Charleston harbor. Historically, it has been understood to extend from the beginning of the seawall at the site of the former Omar Shrine Temple (40-44 East Bay Street) to the intersection of what is now Murray Boulevard and King Street. The higher part of the promenade, paralleling East Battery, as the street is known south of Water Street, to the intersection of Murray Boulevard, is known as High Battery. Fort Sumter is visible from the Cooper River side (High Battery) and the point, as is Castle Pinckney, the World War II aircraft carrier USS Yorktown (CV-10), Fort Moultrie, and Sullivan's Island. Fort Broughton (ca. 1735) and Fort Wilkins (during the American Revolution and War of 1812) occupied White or Oyster Point, so named because of the piles of bleached oyster shells on the point at the tip of the peninsula. In the 18th century, rocks and heavy materials were used to fortify the shore of the Cooper River on the eastern side of the peninsula. In 1838, this area of the Battery, known as High Battery, became a promenade. First used as a public park in 1837, the area now known as White Point Garden became a place for artillery during the American Civil War. 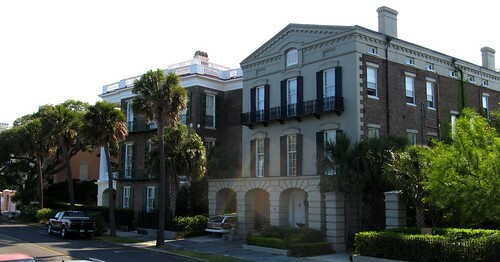 In popular speech and in a number of unofficial guidebooks and Web sites, The Battery and White Point Garden are sometimes referred to as "Battery Park," but the park and seawall promenade are not regarded by the City of Charleston as a single entity, and the term "Battery Park" is not an official designation.